Come and visit the warmth and charm of this restored sea captain's home (c-1829), located in the heart of historic Sandwich Village, and within walking distance of Cape Cod Bay, the Heritage Plantation, four museums and several fine restaurants. The Bed and Breakfast was built by the distinguished Captain Ezra Nye, this Federal-style house reflects the personalities of the innkeepers, with warmth and comfort throughout. There are four rooms and two suites, all beautifully and uniquely decorated, all with private baths and one with a working fireplace. 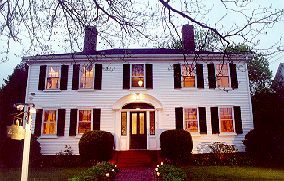 Featured in Glamour Magazine, Innviews, Cape Cod Life and Toronto Life Magazines, the Inn has been chosen Best Bed and Breakfast Upper Cape five out of the last six years. A full, freshly prepared breakfast is the Inn's hallmark. Rates $120 to $145 per night, double occupancy, less off-season. 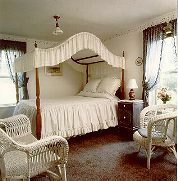 Romantic Country Inns, Getaways and B&Bs offer a great Sandwich lodging alternative to big hotels.